The multidisciplinary Neuro-Oncology team at Cook Children’s is equipped to meet the unique medical needs of children plagued with brain tumors. According to the National Institutes of Health, brain tumors make up about 30 percent of all pediatric cancers. Whether treating tumors such as brainstem gliomas, neurofibromatosis or medulloblastoma, Cook Children’s remains committed to providing patients with compassionate care and innovative treatment solutions. Brain tumors are the most common solid tumors among children, but they are often curable with the proper implementation of chemotherapy, surgery or radiation. By collaborating with an array of cancer consortium groups, we’re able to provide groundbreaking therapies and treatment options to our patients. 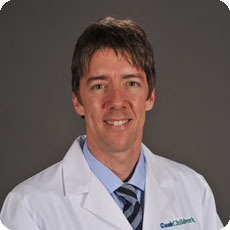 Working closely with the Children’s Oncology Group (COG)—a National Cancer Institute-supported organization that represents the world’s largest cooperative of pediatric cancer clinical trials research—as well as St. Jude Children’s Research Hospital, Cook Children’s remains at the forefront of experimental therapies, protocols, and new drugs and research. Once we receive the pathology results of a child’s brain tumor, we’re able to immediately begin supplying the family with a variety of available treatment options. The COG plays a huge role in helping us provide clinical trials and make decisions for newly diagnosed children. Teaming up with more than 7,500 clinical experts around the world, the COG offers experimental resources to families interested in exploring new clinical trials. In addition, Cook Children’s is a founding member of the Southern Pediatric Neuro-Oncology Consortium (SOPNOC), a Texas-based clinical trials network offering novel treatments to children with brain tumors. While surgeons, radiation oncologists, neuro-oncologists, endocrinologists, nursing staff and other specialists play separate roles along a child’s cancer treatment timeline, they all converge weekly for Neuro-Oncology Tumor Board Conference to share vital information. Our team of physicians and staff come together to discuss new patient cases or those with a change in their medical status. After collectively reviewing MRI (magnetic resonance imaging) scans or examining tissue under the microscope, we’re able to make more informed decisions regarding a patient’s overall care.